Computer Concepts in Action is written specifically to meet the needs of secondary students and teachers, and meets IC3 Standards. This highly visual text teaches essential computer concepts and skills through hands-on activities and projects. 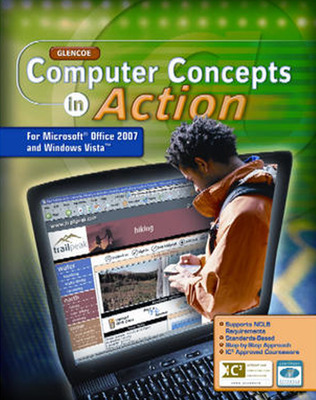 Glencoe’s Computer Concepts in Action revised edition is designed for Microsoft Office 2007 and Windows Vista. It is written specifically to meet the needs of secondary students and teachers, and meets IC3 Standards. This highly visual text teaches essential computer concepts and skills through hands-on activities and projects. Concepts such as ethics, careers, hardware and software applications, the Internet and e-commerce, are taught using high-interest topics and real-world scenarios that are designed to engage students.